DR-IO Series DIN rail mount input/output modules are ideal for connecting real world discrete signals to a computer interface and other electronic equipment. Most computer interfaces can only sense or generate low level TTL (0/5Vdc) signals. The DR-IO-OAC and DR-IO-ODC output modules can be used to sense high level ac and dc signals. 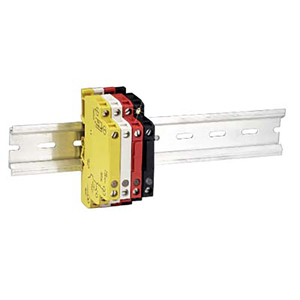 The compact design of the DR-IO modules permit high density mounting on a standard DIN rail. The input modules are available with negative and positive logic versions. Negative logic modules produce a high logic signal when the input signal from the field goes low and a low logic signal when the field input goes high. With the positive logic modules, the logic signal follows the field signal; that is, the logic signal is high when the field signal is high and low when the field signal is low. 참고: 10-position jumper strips are used to interconnect the positive and/or negative logic terminals, eliminating the need to use small jumper wires. The strips are copper plated and insulated, and can be cut to length as desired.